Today I’m sharing a full body circuit workout – perfect for those days at the gym when you’re not sure what to do or need a quick workout. Happy Wednesday! We’re already half way through the week! It’s flying by so far. Before I know it, it’ll be Friday. This workout has a good combination of strength training exercises, bursts of cardio to get your heart rate up, and core work. The reps and length of time for each exercise are listed below. Rest as often and as much as you need to throughout the workout. Your top priority should be maintaining good form, so it that means resting for a bit longer or picking a lighter weight, do it. 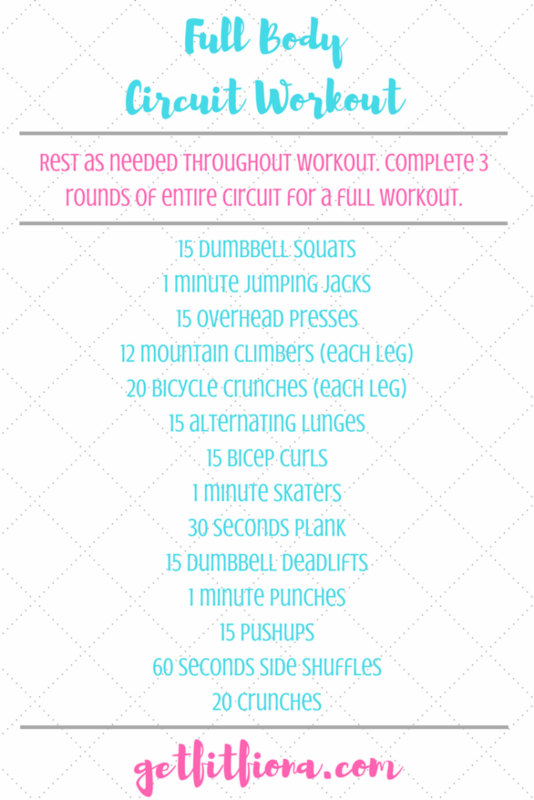 Once you’ve reached the last exercise listed (crunches), complete the entire thing 2 more times for a total of 3 rounds. I’ve added descriptions of each exercise below the graphic just in case you need to refresh your memory of any of the exercises in this workout. As always, you can find more of my workouts on the workouts page. Talk to your doctor before beginning to workout. Honor your body and modify this workout for your body.